Poga "uz priekšu" un "pagriezties pa 360°"
Get ready for takeoff! 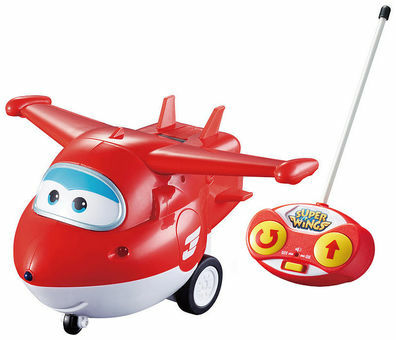 Super Wings™ Jett can zoom forward and spin 360°, all with a simple remote control. In addition to motion, you can activate lights and sounds with the push of a button. The easy-to-use controller is designed for little hands, so Super Wings fans can have fun re-enacting their favorite Jett missions from the popular TV show, or creating their own adventures! Requires 5 AAA batteries (not included).